This is label from my fav bottled water. The best I have ever tasted. 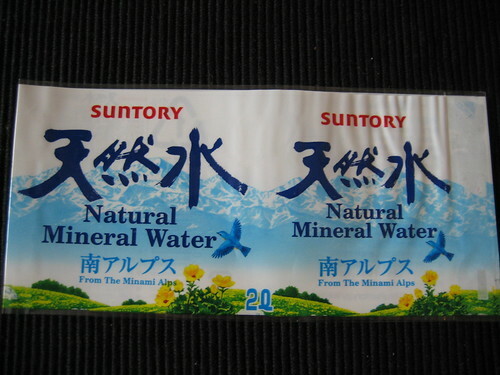 It can be bought in Japan and I wish that Suntory would sell it all over the world. Preferably cheaper then Evian. I don’t drink tap water in the UK – it tastes revolting. And who know’s what in it and how many lead pipes it has gone through? When I have been over to SF, I have tried a few of their bottled water and I have not found a good one yet. The worst one so far is Crystal Geyser *yuck* … not trying that one again. Head over to Dustin’s blog and this post. I had not seen this version before and I am glad I found it. The two days have gone and I have done my last day at work. It was v intense and it was a difficult mixture of giving my replacement all the info she could take (sadly I think I surpassed her level but at least I have done what I could) and saying my Goodbye’s. I am glad there was no ‘All staff’ send-off and only the people that I know came down to a informal send-off. Not going to work tomorrow feels strange – only because I am dwell on it. Tomorrow I can concentrate fully on the stuff that is important to me like packing and sorting the flat out. I’ve got two more days at work. I went out for lunch today with a co-worker and we had a good time. I got another lunch tomorrow and the biggy dept lunch on Wednesday. I am not doing an all staff email with a “drinks do after work”. Why? Well, I don’t want see most of these people again. I don’t like “let’s stay in touch” … we never really talked in the office – do you think we will that outside the office?? Why is it so hard to say the Goodbye’s? And why is it even harder with people that you are not very close to? I have had or will have lunch with most of the people that I like and I have given them my private email. The rest of you … get the hint “Me don’t like you or don’t really care”. I don’t know if we are running out of energy or this is the worst part of the whole process, we are sorting out our own flat. We are going to rent it out furnished but there is still a lot to do. MH saw two estate agents during the week and they are charging between 12-18% for managing the flats. That is a lot and we do not have those margins. We are going to do it privately. We also have a few contacts that have offered to put our details on their company intranet (thanks!!) so we need to take some pics of our flat. And before we can do that we need to make sure that there is a minimal of clutter in the those pics. It is going to be a lot of shifting around and we didn’t have the energy for that yesterday. I have moved before and my stance is to through away as much as possible cos then you don’t have to deal with it later on. I look forward to my last work day – I am going to through away all my boring work clothes. I have not bought anything new for ages and they are really not very nice. I’d like to know if these little odd things & situations happens to anyone else? I often sleep on my stomach, and I wake up during the night with my ear hurts like hell. The blood supply (my guess) has been cut off and I know by slowly raising my head it is gonna hurt even more. Anyone?? Do you ever get caught in situation where you talk to nice people that you know but do not know how to end the conversation? I had one or two more questions in my mind when I was thinking of this blog post but they are now forgotten … ah well. Do tell me about your oddities. I find this picture odd. A Buddist monk having his pic taken in front of a tank. The Thai military coup has the peopleâ€™s support and letâ€™s hopes that it all goes well and there will be no blood on the street.